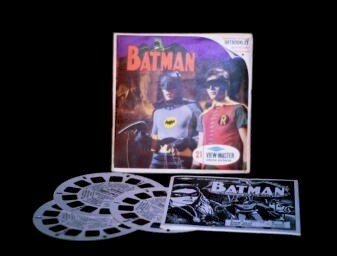 Three reel 3-D Viewmaster set with booklet from the original campy 60's TV show featuring Adam West and Burt Ward. Holy Collectibles, Batman! When I was a kid, everybody had a viewmaster viewer. Adults liked the nature and travel pictures, but kids went for the TV and movie related reels. Viewmaster photos were taken with a special 3-D camera(with two lenses), and had an other-worldly look about them. Website design and hosting by Sohodojo Business Services. Item 23 of 466 items displayed in viewer. 0 items in cart.